Kinshachi Plate @ Aichi Gakuin University Meijo Koen Capmus: Why don’t you eat a castle? When a friend of mine and I walked by the information booth of Aichi Gakuin University’s Meijo Koen Campus, a guard came and talked to us. Actually, we had talked before going to the school cafeteria. I took a Chinese exercise class near Meijo (-Koen) Park last Thursday. After the class, the friend and I went to Aichi Gakuin University’s Meijo Koen Campus nearby. When we were looking at the map on the wall of the information booth, the guard came to tell us how to get to the cafeteria. The cafeteria had two types of lunch special: Today’s Lunch and Today’s Domburi. Domburi means a bowl or a bowl of rice with other food on top. My friend decided to have Today’s Lunch, and I, Today’s Domburi. 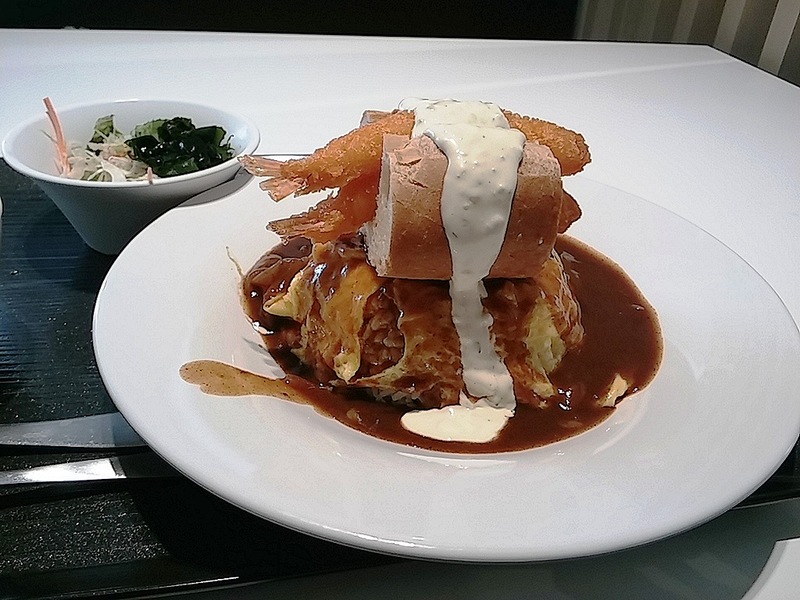 I was overwhelmed by the appearance of Today’s Domburi: “Kinshachi Plate.” It was a baguette sandwich with two fried prawns dressed with tartar sauce on top of a rice omelet with demiglace sauce. This dish was a represenation of Nagoya Castle. Kinshachi means golden shachi(-hoko). Shachihoko is a fish-shaped ornament decorating the top of the roof and a kind of charm against fire. 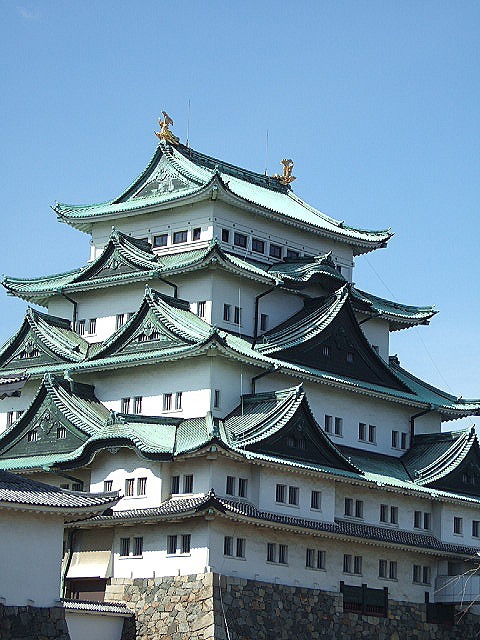 Nagoya is famous for the castle and the roof ornament. 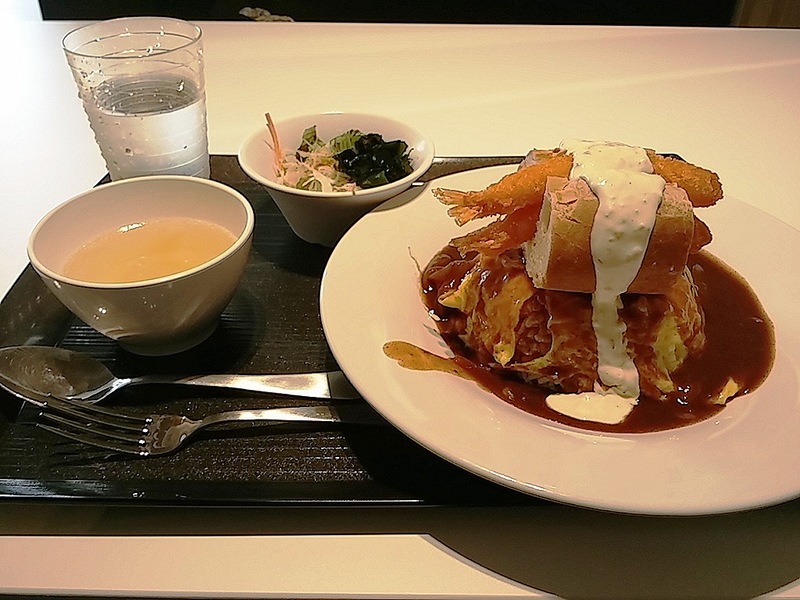 That is, the rice omelet represents the building of the castle, and the bread the roof, the fried prawns, Kinshachi. Funny! It was a little difficult to eat, but the Kinshachi Plate was very nice. The lunch was only 500 yen with a cup of soup and a salad. Today’s Lunch had soup and cost 450 yen. 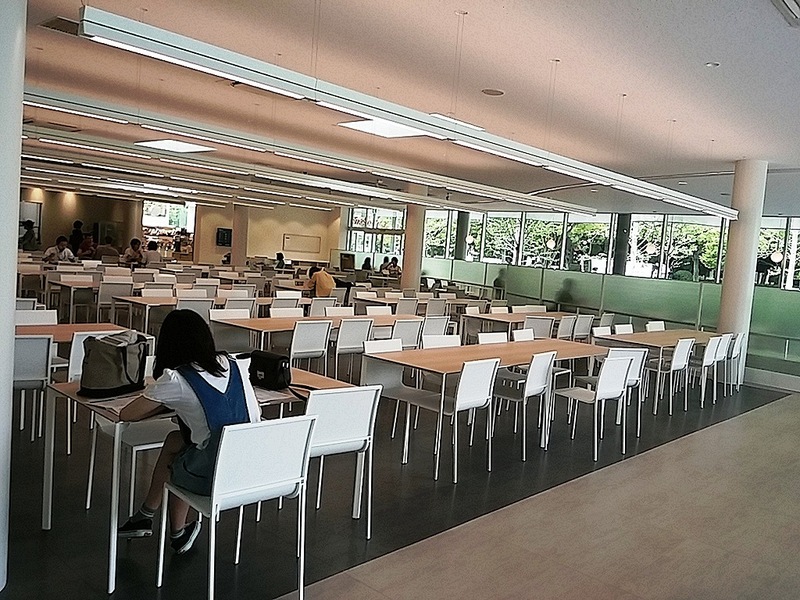 The Meijo Koen Campus of Aichi Gakuin University just opened this April. The public can use its cafeteria except from 12:00 to 1:00 p.m. According to the guard, there is a café upstairs. 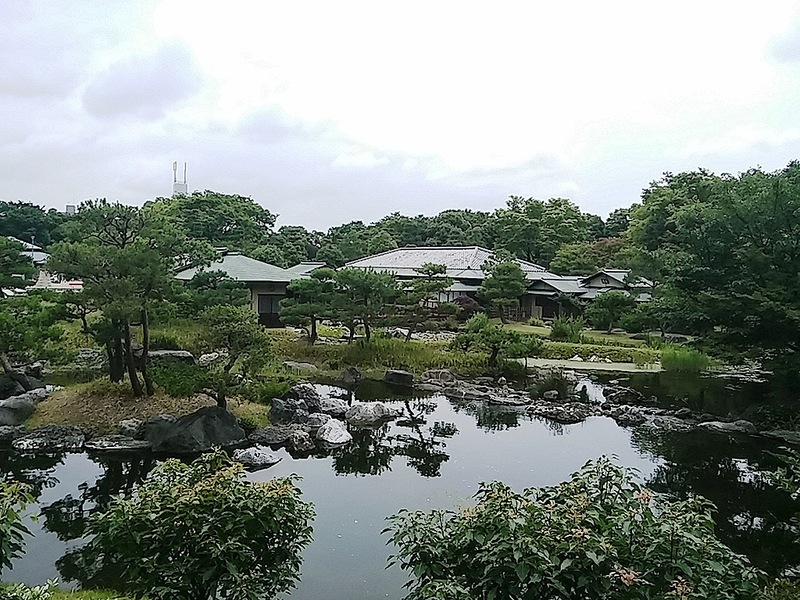 How about dropping by the cafeteria when you come to or near Meijo (-Koen) Park or Nagoya Castle? It is a few-minute-walk from the exit 2 of Meijokoen Subway Station. 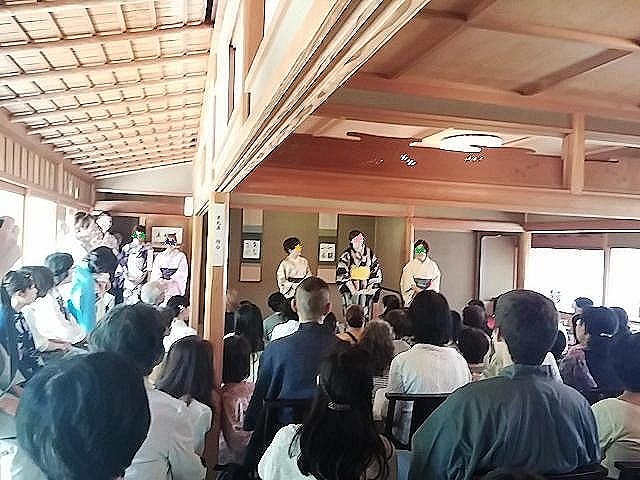 Ajisai Tea Ceremony ~ Cross-cultural Event in Shirotori Garden : I’m happy that I came to Japan! “I never teach them in a cursory style just because they are non-Japanese or they are staying here a very short time. 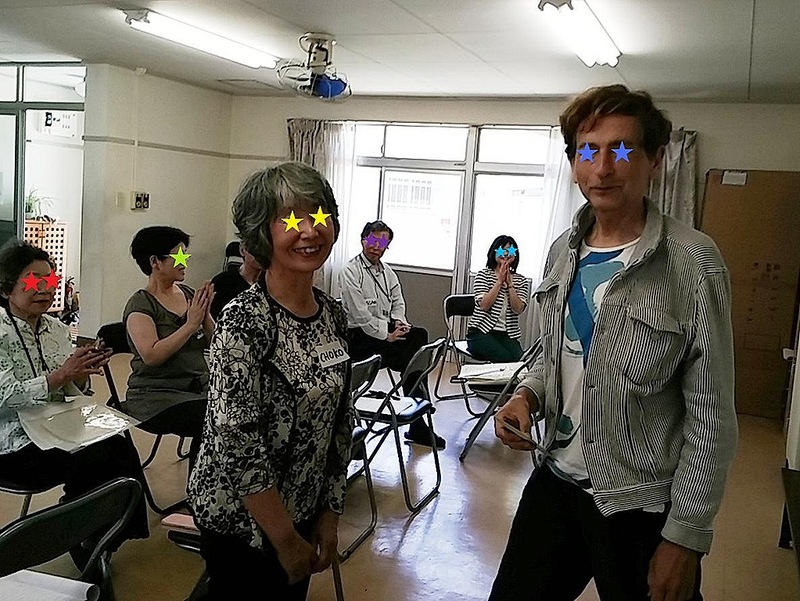 I think teaching Japanese culture has nothing to do with the nationality or duration of stay …” Ms. Kato began talking to the audience. 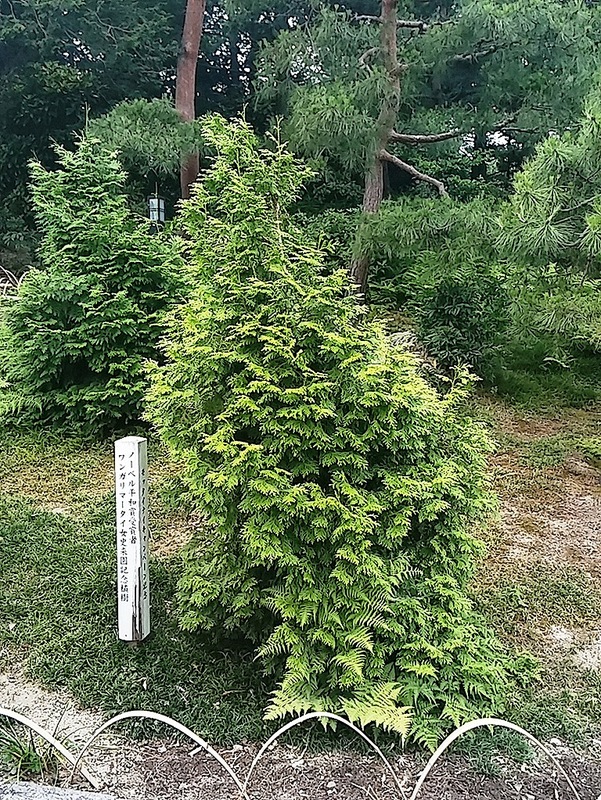 There was an interesting event named “Ajisai Tea Ceremony” in Shirotori Garden near Atsuta(-Jingu) Shrine last Saturday. Some foreigners who love the Japanese tea ceremony made tea for Japanese people following the oficial protocol, some non-Japanese ladies appeared in yukata, a kind of kimono, which had been made by themselves, and talked about their favorite points of Japanese culture, and several Japanese volunteer guides showed some of us around the garden with English commentary. I took part in the English guided tour and the talk show. 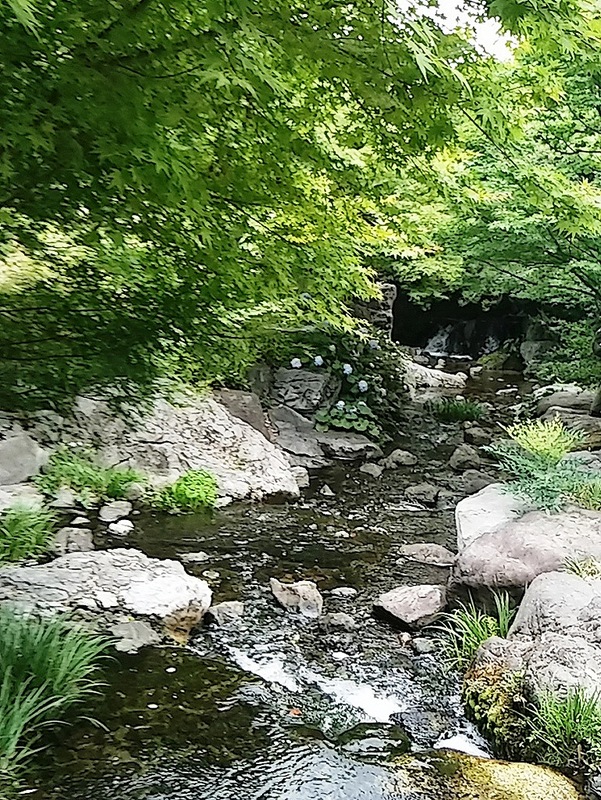 (About Shirotori Garden and the English guided tour is HERE.) The tour finished around 11:20. I arrived in time the talk show which was supposed to start at 11:30, but the room was already packed and I had to stand. 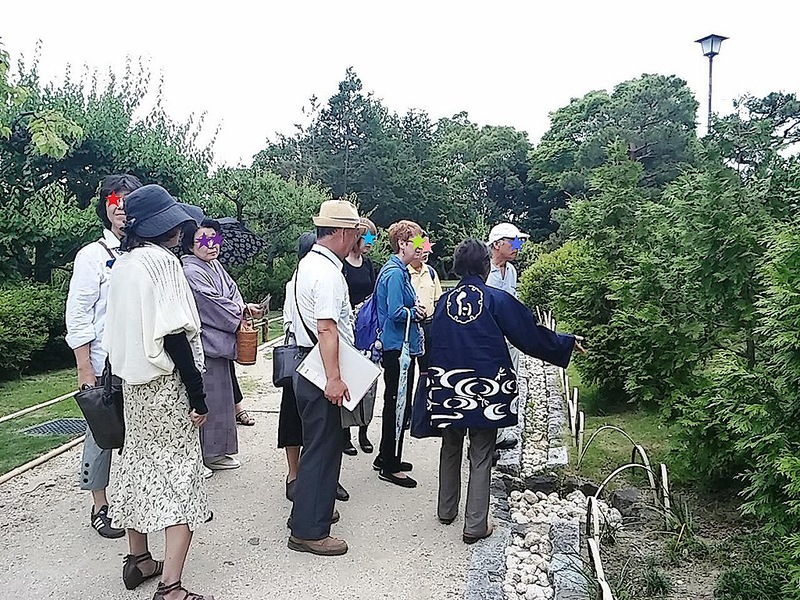 I saw many people in yukata or kimono among the audience because the people who were wearing traditional Japanese attire were able to enter the garden for free that day. (The regular entrance fee is 300 yen.) In addition, those people were not all Japanese. 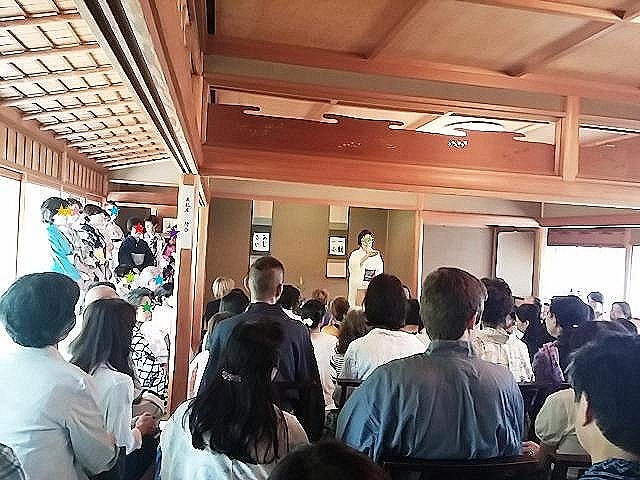 Ms. Kato is the teacher who taught the performers of the talk show how to make yukata. 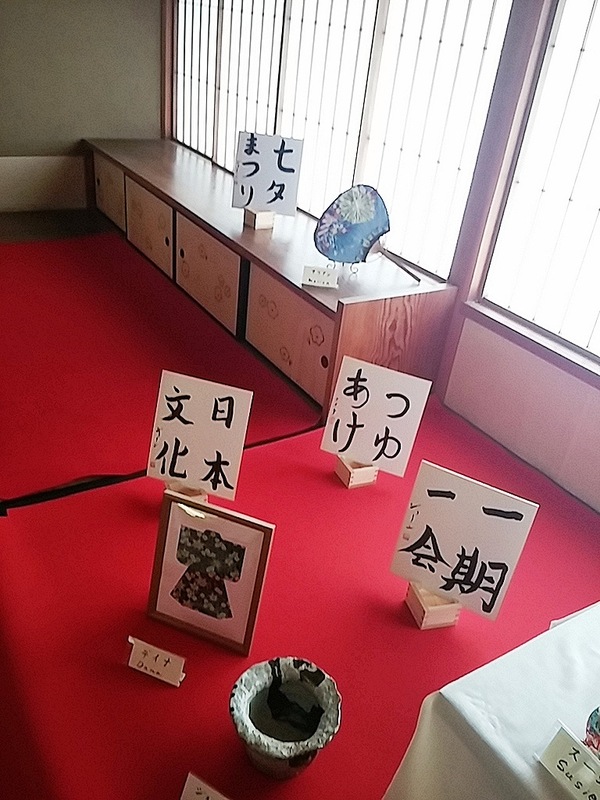 Actually, she teaches not only making kimonos but also about Japanese tea ceremony, flower arrangement and traditional practices. 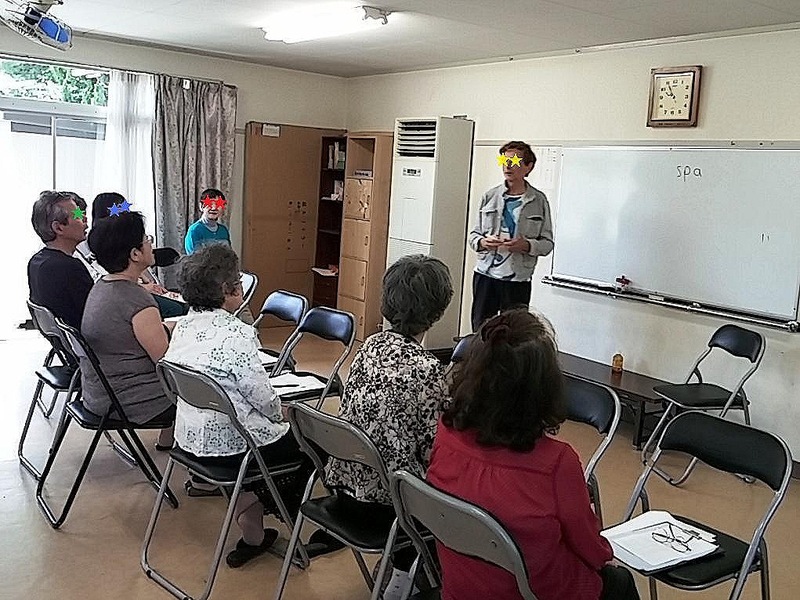 Moreover, she is a pioneer among licensed interpreter-guides in Nagoya. “…I knew they had sewn by hand with effort, but I sometimes drew the thread out when I thought the seams were rough. I’m sure they had a tough time. But I believe they should do good finishing jobs. Besides I didn’t want people to think, “Because they’re not Japanese,” if they found my students’ clumsy sewing. But it might have been my fault that they couldn’t sew well. I’m sorry…” said Ms. Kato, and some performers melted in tears. 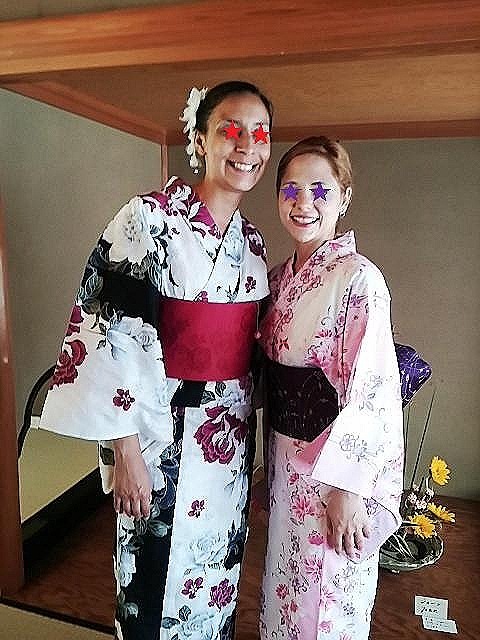 It took most of the foreign ladies more than one year to complete their yukata. 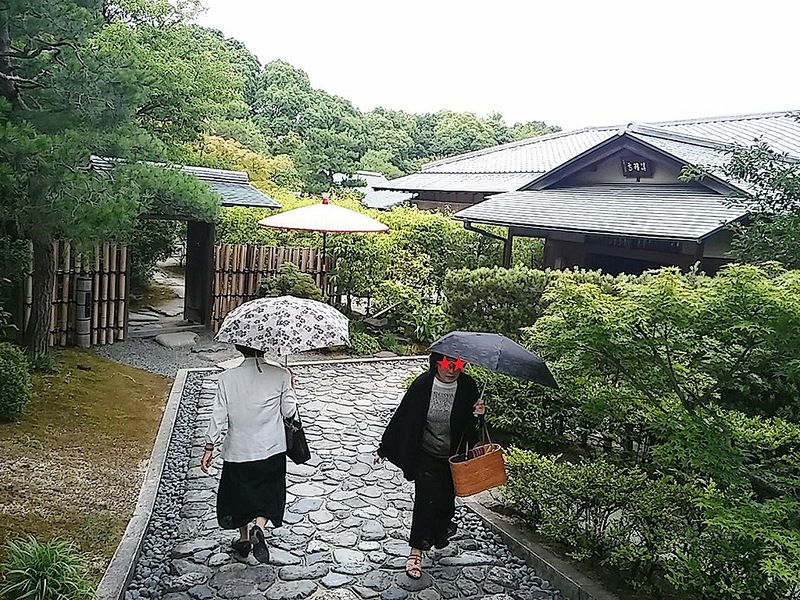 One of them said, “I was very surprised when I knew I had to make yukata without patterns or a sewing machine.” Her words helped me to recall the differences between European and Japanese clothes. When you make Western clothes, you take the person’s size and make the pattern from the measurement. And you cut the materials with the pattern, and then you seam each part to fit together 3-demensionally. On the other hand, kimono is made by sewing rectangler pieces of materials and use sash belts to fit to your body. If the kimono gets too old to wear, you just draw the threads out and take it back to the rectangler pieces. You can make cushion covers or something with them. Then finally the materials finish their life as dusters. It is one of the innovative Japanese ideas to recycle kimono materials. All of the performers looked very nice and proud in their original yukata. You can never find another like it. They did not just sew the materials, write letters with a brush, or put flowers in the vase. They have received Ms. Kato’s spirit and have been learning Japanese culture in earnest. “I’m really happy that I came to Japan.” Some of them were in tears. 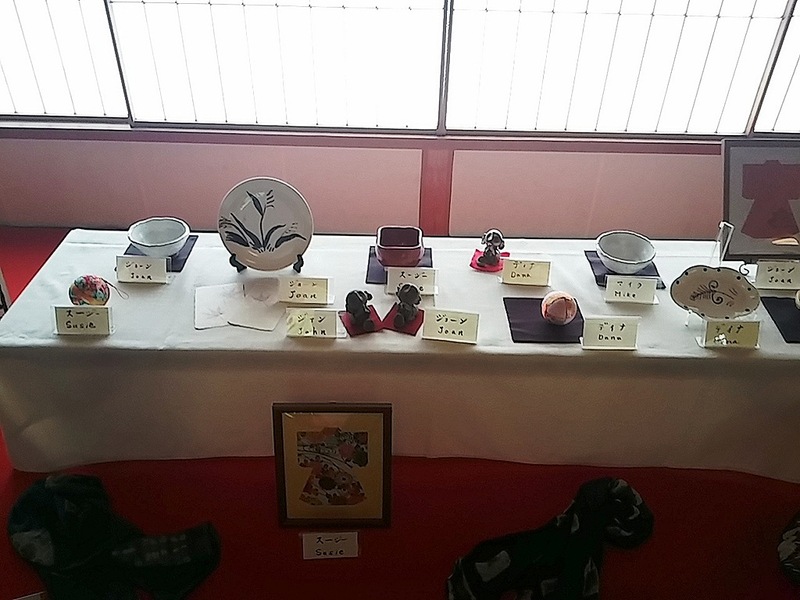 Those ladies’ words were impressive and their works, such as yukata, calligraphies, ceramics, and arranged flowers, were wonderful. The talk show brought the Japanese audience the rediscovery of the brilliance of their own culture, and non-Japanese people the motivation for taking an interest in Japanese culture. I was glad I joined the meeting. “Does anyone have free time this Thursday?” a friend of mine said. I was having lunch with some of my friends at a cafeteria after a Tai Chi practice last Tuesday. I did not know what she was going to bring up, but I rummaged through my bag and took out my schedule book. An event had been redlined in the box of the Thursday on the calendar. “I have time. So…?” I looked up from my schedule and saw her. This time, it was her turn to rummage through her bag. She took out an envelope and drew a few small cards from it. 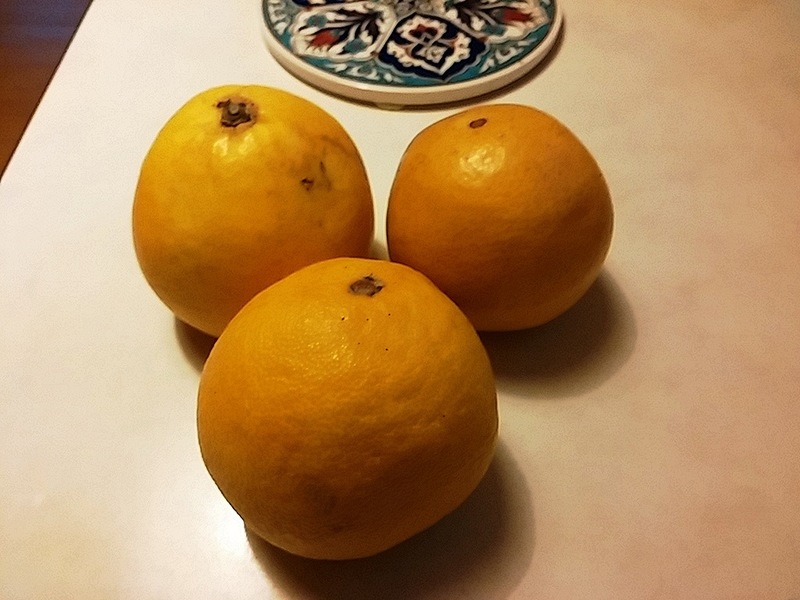 And then, she put them on the table. When I picked one of them, she put another thing on the table. 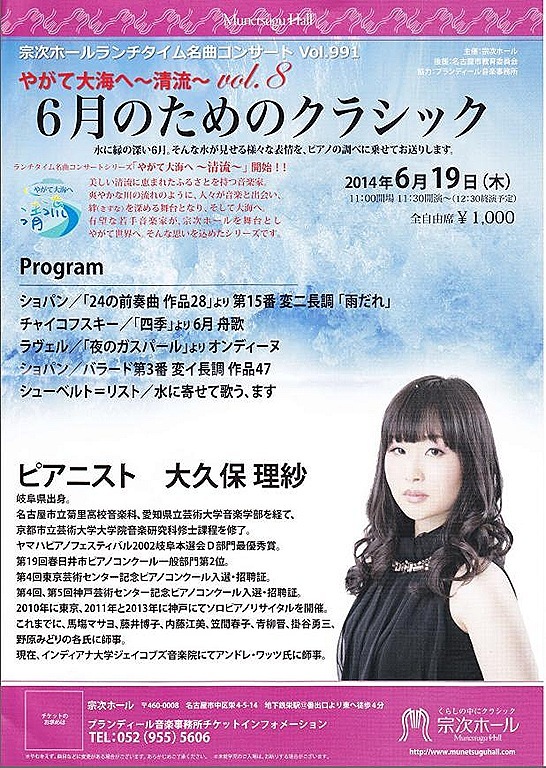 It was a flyer of the concert with the program and a picture of a lovely girl. It seemed to be a piano recital. “Oh, I am. But I still have extra tickets. Why don’t you go to the concert with your friends? I’ll give you the tickets,” she said and handed me the rest of the tickets and flyers. She gave me four tickets. 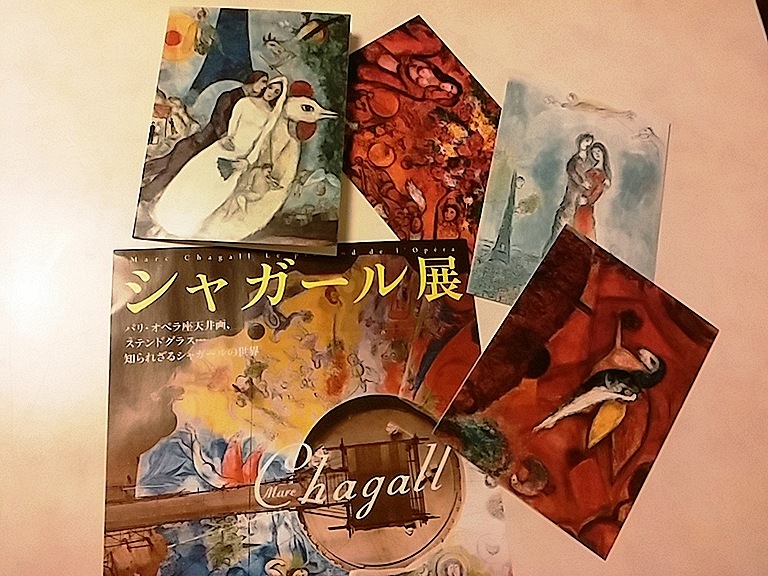 I decided to go to the concert with my 82-year-old mother and give the rest to my friends. The concert was held at Munetsugu Hall in Sakae, Nagoya. Munetsugu Hall is a concert hall for only classical music. Tokuji Munetsugu, the founder of a curry restaurant chain, “Curry House CoCo Ichibanya,” established the concert hall in 2007 to have people enjoy classical music more easily and develop younger artists. They offer a concert at lunchtime (11:30 – 12:30) almost every day for only 1,000 yen. This piano recital was one of the lunchtime concerts. Actually, I don’t listen to classical music so much. But the concert was very nice and my mother and I had a wonderful time. I met a friend of mine to whom I had given the rest of the tickets at the hall. She came there with her friend, and they were also very pleased to have a great time. 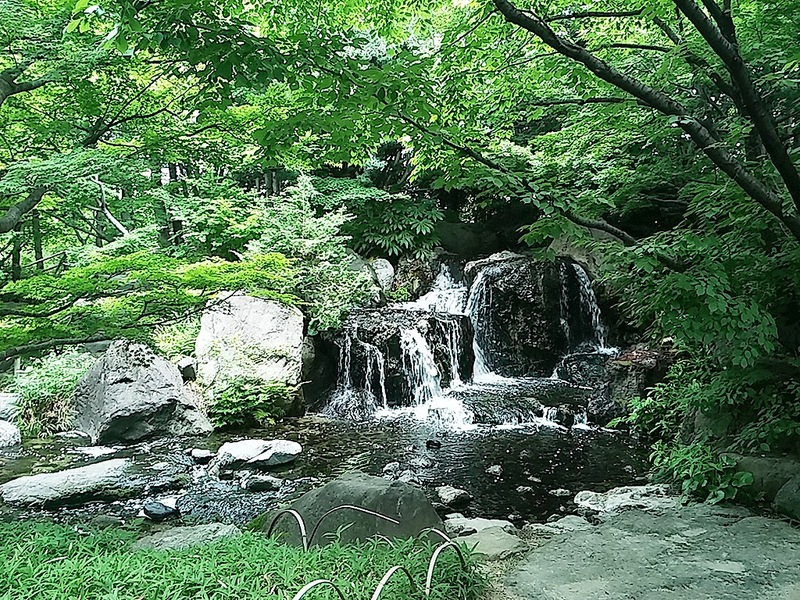 It is a good idea to drop by Munetsugu Hall at lunchtime and enjoy classical music once in a while. Classical music has a healing power. Nagoya’s summer is hot and humid. Why don’t you have an elegant time in the cool concert hall sometimes? You’ll feel refreshed when you leave the hall. Let’s Speak English! ~ A meeting in a small English club ~ : Is your son good-looking? 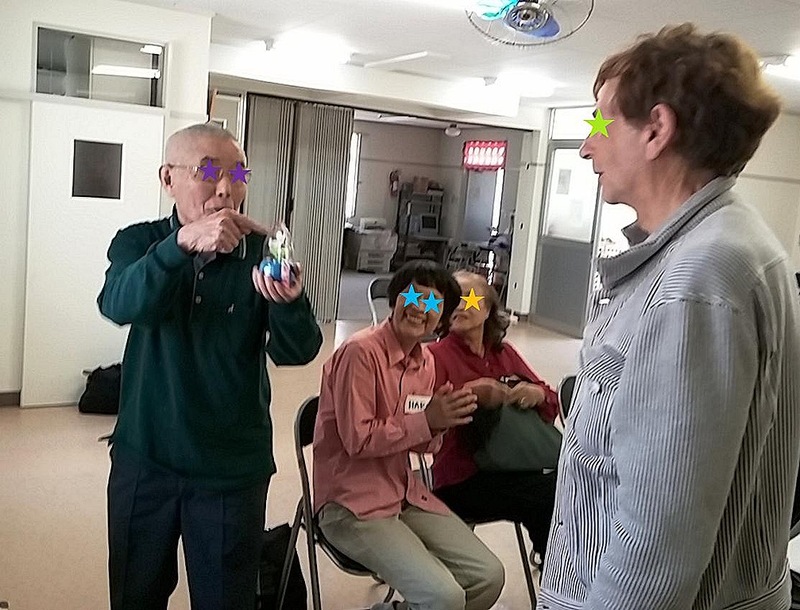 Most of the club members met Ricky at the club two years ago, when they were excited so much because it was the first time for them to talk to a non-Japanese in English. They fired many first-meeting-types of questions, such as, “Where are you from?” or “Can you use chopsticks well?” at that time. They asked Ricky the same questions many times because they were too busy thinking what they would ask him to hear others. So, Ricky had to say “Fish,” many times. They asked, “What kind of food do you like best?” again and again… But Ricky answered the questions politely without being cross. Thank you, Ricky! That was why, I told the members not to ask Ricky similar questions before the meeting this time. “So, you can’t ask Ricky “Where are you from?” or “Where do you live?” or “Do you like sushi?” and so on. Understand?” They screamed. 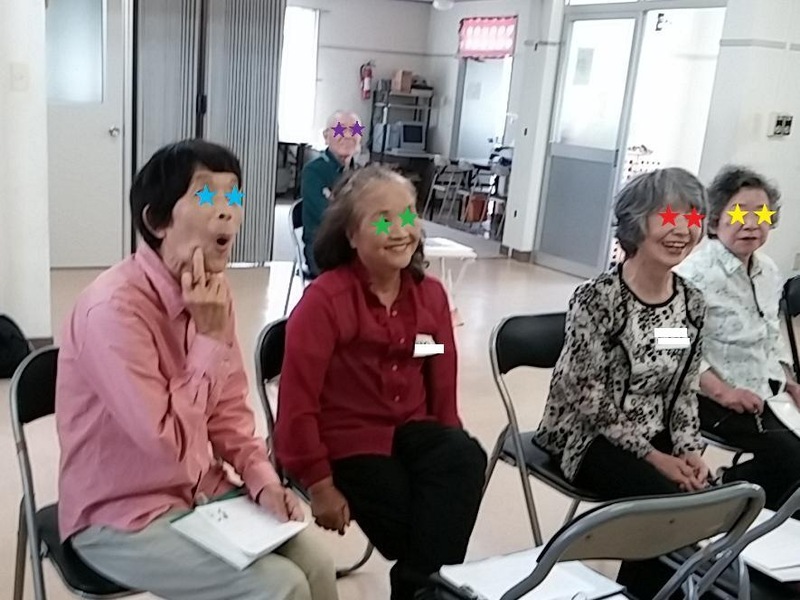 Usually the club has five seniors: Nori, Hossan, Choko, Akiko, and Mayumi. But the room was merrier than usual that day because we had ten people excluding Ricky and me. Mayumi brought her husband, Umeo. 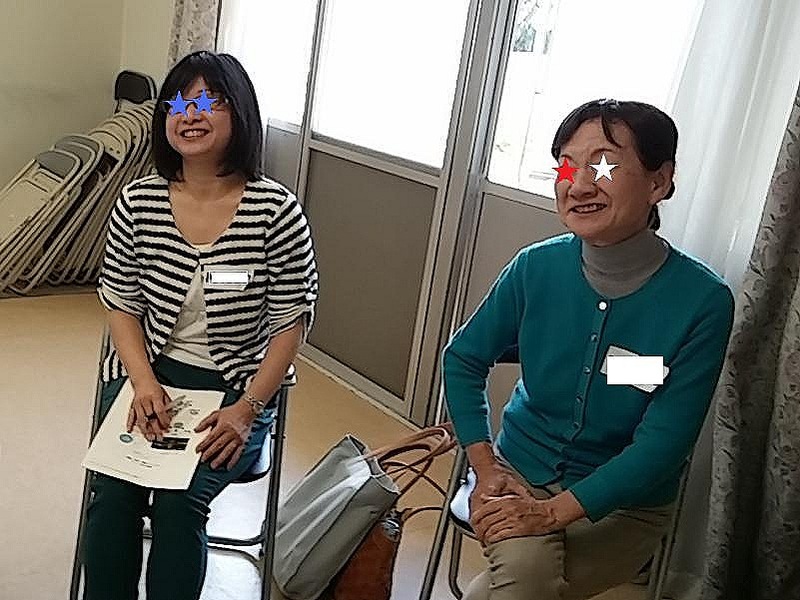 Two old members, Toshiko and Haru, came. Toshiko brought her friend, Manami, too. And Saeko came to the club with her new walker. She was a regular member, but had not appeared for a while since she broke a breast bone last December. I was very happy to meet old and new people at one time. They also looked happy and excited. Their English was much greater than I had expected. They tried hard to talk to Ricky with various questions: Where are you going to live in England? ; How do you like it in Japan? ; What is inconvenient living in Japan? ; What are the good and bad points in the international marriage? etc. Of course, there were some impolite questions, too, like “How old are you?” or “Is your son good-looking?” But these questions brought additional excitement to the meeting. Then THAT question came: What kind of food do you like? Hey, hey, you asked the same question many times two years ago! I thought. But Ricky kindly replied smiling, “Eels.” Oh, how specific answer he said this time! 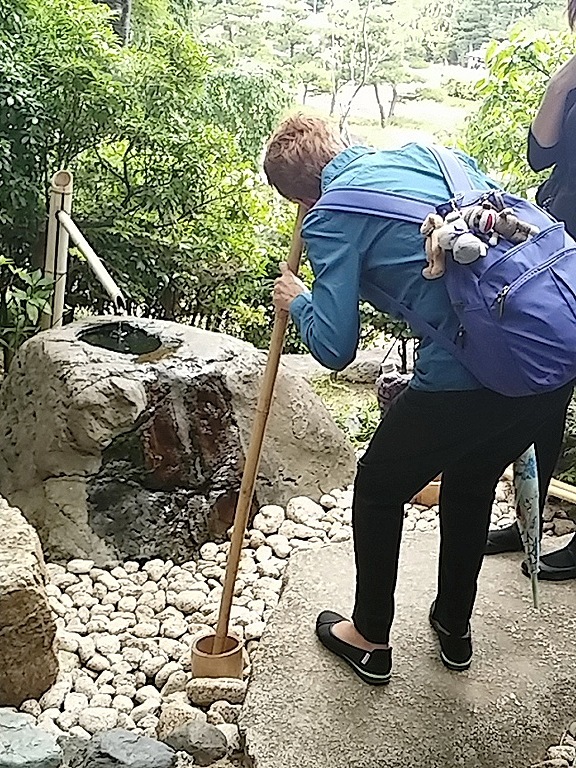 The members murmured “Oh, eels…eels…eels…” But a few minutes later, someone asked THAT question again, “Excuse me, what kind of food do you like best?” Come on! “Eels,” said Ricky in a calm way. Probably the same questions and answers repeated a few more times….But Ricky replied politely without any disgusting expressions this time, too. Thank you again, Ricky!